Monkeys – In – Space!! Le Salon Des Refusés #3 happened at KOI, on January 3oth, and it was out of this world! The Dancing Monkey Players presented Shaniqua and the Space Queen by Mike Czuba. A lost gem from the early 2000’s… Gem I tell you! The Dancing Monkey Players are: Michelle Brandenburg, Lonni Olson, Constantine X. Anastasakis, Filsan Dualeh, Wil Knoll and Melissa Tuplin. Photos by Christopher Tuplin and Hodan Dualeh. 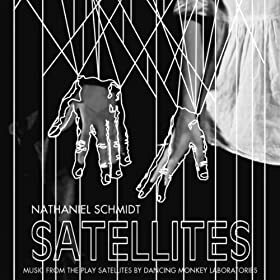 Dancing Monkey Laboratories is a performance collective lead by scientists Mike Czuba, Melissa Tuplin, Nathaniel Schmidt, Leon Schwesinger and Larry Lamont. We are interested in researching, exploring, discovering and deconstructing what (T)heatre can be by creating new works that speak to diverse audiences. Dancing Monkey believes in experimentation without alienation – creating theatrical experiences that offer universal content, challenging aesthetics, while building bridges into other artistic communities and towards new audiences. Founded in Montreal, Quebec, Dancing Monkey now also has a laboratory in Calgary, Alberta. Creating new forms, such as the “Night Play”, Dancing Monkey Laboratories is pleased to be following in the footsteps and dreams of our Nocturlogical predecessors. If you have to ask if something exists, it already does, if it is all lies, it is also completely true – Nocturlogically speaking. Mike Czuba’s play ‘I AM I’ is available @ Original Works Publishing.